A wasp puts its tongue on a fruit fly larva. Sensing danger, the larva quickly reverses. That response — to stop the wasp from laying its eggs in the larva — is the work of a single pair of neurons in the larva’s brain, according to new UO-led research. The discovery emerged from basic, early development research in the UO lab of biologist Chris Doe. It appeared Aug. 2 in a paper on brain descending neurons in the journal eLife. Doe’s seven-member team successfully mapped the circuitry — from the brain downstream to specific motor neurons that control a muscle group — that allows for a smooth and rapid switch in movement. The work, he said, is unprecedented. “The big step we’ve made is that we have a single neuron that both triggers a new behavior and suppresses an antagonistic behavior,” said Doe, a biology professor and co-director of the University of Oregon’s Institute of Neuroscience. Doe also is a Howard Hughes Medical Institute investigator and member of the UO’s Institute of Molecular Biology. Changing directions is vital to survival for fruit flies. While larvae contend with wasps, adults are prime dinner choices of spiders, ants and beetles. Just how neural circuits trigger smooth switching between antagonistic behaviors is a mystery in most animals, Doe said, but it has been seen in nematodes as well. The methodology used in the study, Doe said, will help other scientists link other direct connections between individual brain and nervous system neurons. 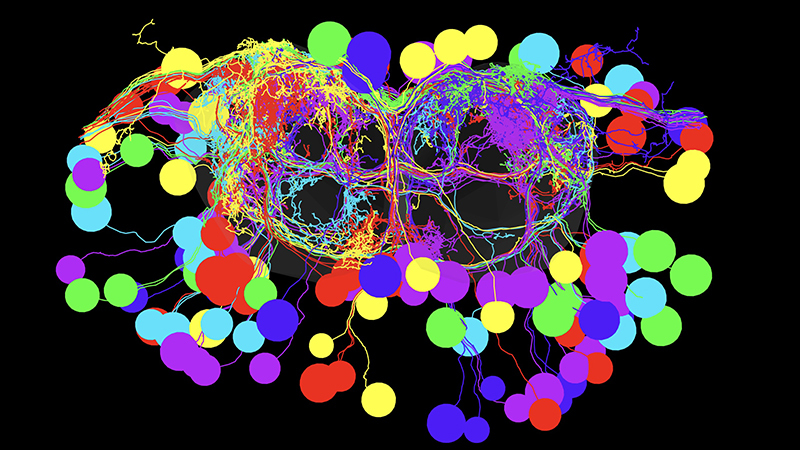 Doe’s lab already is looking at neurons tied to navigation behavior in fruit flies. As the brain circuitry is better understood, Doe said, the payoff potentially could be in more precise human prosthetics or in the robotics of bomb-searching robots or rovers exploring the surfaces on other planets. In the project, Doe’s team used genetic screening, electron microscopy, and light-based and manual manipulations. Fluorescent proteins inserted into larvae and adult flies helped track telltale chemical flows in the circuitry as behaviors changed course. The team methodically moved through several steps to identify the backward-inducing brain neurons, starting with more than 300 and winnowing the population until the final two were found. The biggest surprise, Doe said, was realizing that the same pair of neurons in a larva retracted its connection to the suite of muscles during metamorphosis and then re-engaged with the motor neurons for the six legs that control muscles in the adults. In limbless larvae, crawling is done by peristalsis, or contractions. For escape purposes, one behavior must be rapidly inactivated by way of neural communication, he said. Flies and mosquitoes, for instance, can sense a human’s swat and change directions to avoid contact. Larvae can recognize and avoid noxious environments like high salt or bright light using backwards locomotion. Doe has explored the early development of neural stem cells as a Howard Hughes Medical Institute investigator since 1994. About five years ago, his lab began studying neural circuits generating motor behaviors. Doe’s team included Arnaldo Carreira-Rosario, Aref Arzan Zarin, Matthew Q. Clark and Laurina Manning, all of the UO, and Richard Fetter and Albert Cardona, both of the Janelia Research Campus of the Howard Hughes Medical Institute. The National Institutes of Health and Howard Hughes Medical Institute primarily funded the research. Clark also was supported by a Porter Physiology Development Fellowship that he received in 2015 from the American Physiological Society.